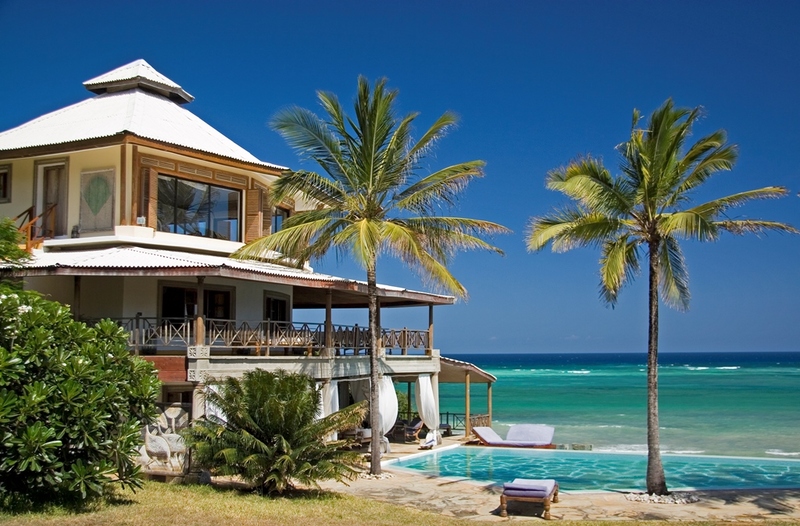 Considered by many as the finest Villas on the East African Coast, Alfajiri Villas overlook the Indian Ocean and theirs elevated positions ensure privacy and stunning views. 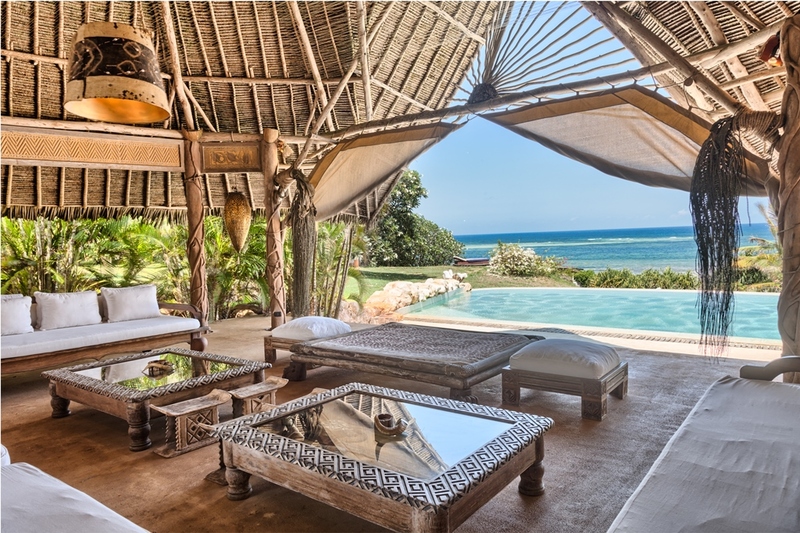 African Style villas where the theme is high Makuti roofs, ivory Danish floors, wooden beams, Lamu doors and impressive African and Far Eastern Artifacts. Most of the furniture is made on the property in the villa’s workshop. The gardens are meticulously maintained and include many palms from the villa’s nursery. Large verandas with huge hand carved sofas with cushions dominate the front of the villas where a stretch swimming pool sits on the edge of a small cliff merging into the sea and the horizon. The Beach Villas are 2 luxuriously appointed double bedrooms with their own bathroom. One of them overlooks the Indian Ocean, and the other the overflowing swimming pool. The service is high quality yet discreet with the Mediterranean-style cuisine served in each villa easily adapted to suit guests needs. All drinks including imported wines, beers, imported spirits and soft drinks are included as is massage, reflexology and snorkeling, tennis, squash and golf located nearby and the use of chauffeured transport. 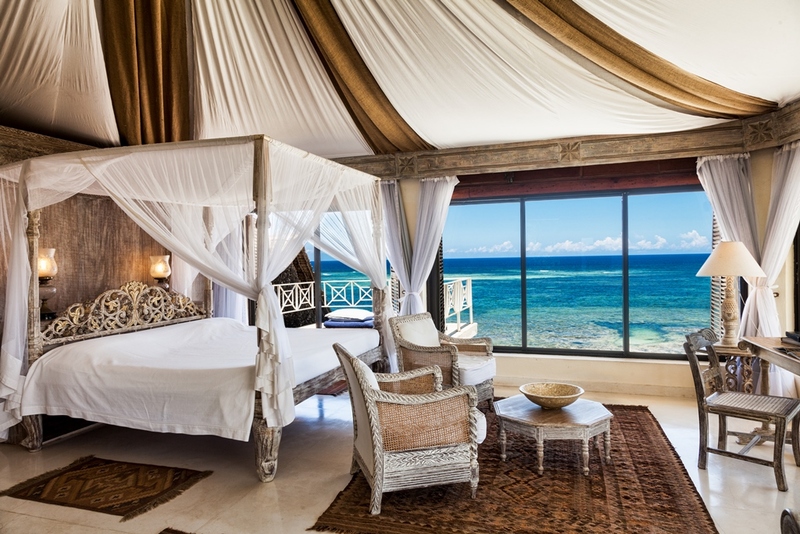 Positioned on low coral cliffs above the soft sands of Diani Beach on Kenya’s southern coast, Alfajiri is a collection of 3 luxuriously appointed and fully staffed villas which are ideal for small groups or families. The three-storied Cliff Villa, has an Arab-influenced interior design and large picture windows with stunning views. Eight guests can be accommodated in the 4 bright rooms with exclusive use of the villa and its private pool. It is one hour from the Mombasa Airport, with 10 daily scheduled services from Nairobi’s Jomo Kenyatta and Wilson Airports. Direct flights from England, Germany, France, Switzerland and Italy into Mombasa are also available. Five minutes from Ukunda Airstrip, for private charters and a daily service to & from the Maasai Mara. The villas owners, Marica and Fabrizio will host you during your stay, meeting you daily to fulfill all your requirements and organize your activities. Feeling energetic? 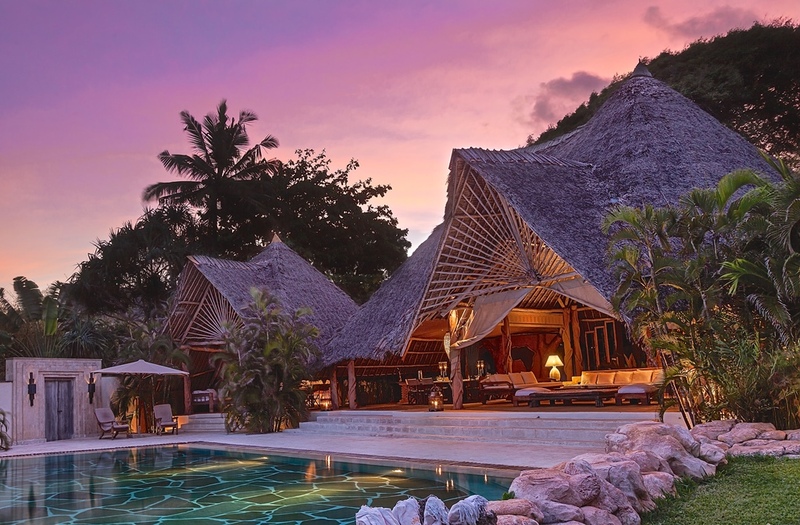 Alfajiri boasts a range of activities; golf at a nearby 18 hole Golf course, Kite surfing, snorkeling, diving, safaris - even docile whale sharks in the ocean and the elephants in the hills are there for the asking. Would you like to fulfill a dream and stay at this amazing place? Than please go ahead, send us your info, dates etc. and we'll secure a booking for you! !